Uncommon Threads | A place to share the things that inspire us. We all know it’s good to be a giver…it’s ingrained in us from the moment our feet met the earth. All too often though, more often than we’d like to admit, our giving is out of guilt, done only with credit card swipes, seemingly abstract and sterile. Our giving has become dollars and cents: our real “eye on the prize” is the tax write off we receive in return, not the full heart and peace of mind, knowing we made the world slightly better for someone. Think back, when was the last time you felt so compelled to help, so drawn to volunteer, so moved that you couldn’t help but try to make a difference? For us, it was WEN. For 25 years, the Women’s Employment Network in Kansas City has been helping women get their careers back and thus regain their self worth, while gaining independence and falling back in love with who they are. From burned-out business owners looking for change, to battered and abused single mothers who have nothing more than a G.E.D., every woman that passes through WEN’s doors has a moving and almost eerily relatable story. 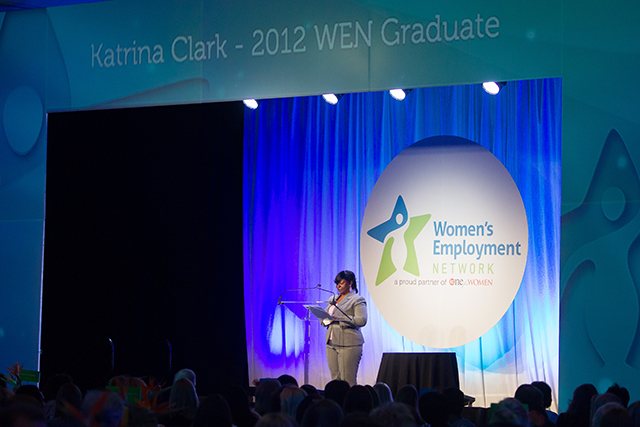 One recent graduate’s story sent chills down the collective spines of the packed banquet hall filled with CEO’s, socialites, and public servants at WEN’s annual luncheon this spring. She was a single mother dependent on her very loving and long-term boyfriend. One day, however, her love, her life, and her will were shattered: her once doting partner shot her repeatedly during a domestic dispute. She was left with no home, no way to support herself or her daughter, enormous medical bills, and more than a year of very dark recovery. A friend directed her to the Women’s Employment Network and after much soul searching, she began the journey to a happier her. Through WEN’s program, she relearned life skills: how to take back control of her finances, how to rework her resume so she could secure interviews, and how to properly interview to land a full time job. She worked closely with the WEN social worker who helped her with housing, and issues with her daughter. WEN even helped her dress the part, giving her not only tips for proper career wear, but actually providing her with suits for her interviews. At the end of the 5 week program, she indeed found a job that would help her get back on her feet. More importantly, she learned loving herself might be hard at times, but when you love yourself you can take over the world. This is just one story, but it could really be anyone’s story. The work that WEN does builds women like you and me, and that is what compels us to give back. We see ourselves in every woman that embarks on her journey with WEN, and no matter if the gift is monetary, time spent working with women on interview skills, teaching women how to wear their hair, or helping them get back on track with a financial budget, each act of giving directly impacts a woman, and really does make their life that much more worthwhile. It’s no secret that linen is the one of the most expensive textiles in the world. It’s also the oldest: once reserved for only the top tier of royalty and most bougie of bougie. Its ability to absorb and wick moister faster than most any other fabric makes it a natural for hot, humid tropical climates. Which is probably why when I think linen, my mind automatically goes to beaches, bronze bodies, deck shoes, and the faint sound of calypso music drifting in the salty breeze. I think relaxed, kicked back, and sandy toes – but never do my thoughts drift to how difficult this easy breezy fabric is to produce. Needless to say, it’s no holiday! Linen is made from the fibers that are found in the stem of the flax plant. More often than not, it takes countless plants to make a modest amount of fabric. The stem must be separated from all other parts of the plant in order to be made into what we know as linen. Of course, now in 2015, we have modern day technology to help with the separation process, but traditionally this was done by hand. After the stems are separated from the other bits of the plant, the fibers have to be separated from the stem. Although these fibers are very strong, this process can’t be done in haste: any broken or smashed fibers are unusable. Because of this, a chemically-produced bacteria is used to eat away at the stalks and separate the fibers. After this separation comes, you guessed it, more separation! The fibers are combed to more definitively separate the soft and usable fibers from the stiff and hard unusable fibers. Finally the fibers are ready to be spun into yarn and then woven into their final textile state. Phew! So after that very abbreviated explanation of how linen comes to be, can you really say that you don’t have a love and new found appreciation for one of the first fabrics known to man? Despite common perceptions about the Midwest, we have culture, education and much more than farms in the center of our country. In an effort to prove the fact that we Midwesterners have long moved past Mom jeans and Christmas sweaters, we remind our coastal friends that middle America is home to several major fashion brands. There is more than enough to explore and we couldn’t think of a better location for one of our stores than Kansas City. It’s a town full of rich history and extremely diverse culture. The opportunity to experience everything from unique shopping to historical areas, to fine dining and incredible libations, awaits to intrigue you in this not-so-little city. If you happen to have a chance to poke your head in and visit us, might we suggest some of our very favorite places that we locals love. Antiques: The West Bottoms is a marketplace that houses a mind-blowing amount of antique and re-purposed retail stores. The cluster of tall brick and mortar buildings and warehouses which make up the market date back to the 19th century, and was an integral part of the river trade. What makes this area so unique is that many of the merchants are only open on the first weekend of every month. The streets are lined with food trucks, and street performers, and beautiful period music fills the air. Lover of antiques or not, it’s a pretty beautiful experience in history. The Perks: Kansas City is a coffee town! The streets are dotted with brew shops that offer flavors to fit every taste. Our favorite happens to be a little bit artisan with a slight unintimidating hipster twist. Thou Mayest Roasters was founded by two coffee lovers, of course. This java hub is cozily nestled in a charming 110 year-old building with a massive bar on the first floor (they also do craft cocktails) and plenty of seating on the second floor. Beans are roasted on site, and you can watch your coffee brewed and filtered by hand, no fancy machinery here! Thou Mayest cares about your coffee, offering a TRUE coffee experience that is really hard to find. Serious and Savory: Food doesn’t get much better than it does in the Midwest. And although Kansas City finds itself with more than its fair share of James Beard-nominated and award winning chefs, one holds our hearts and tastebuds. At the helm of the Rieger Hotel Grill & Exchange is Howard Hanna. This man isn’t just a chef, or an artist, he’s pretty much a food God. Biting into anything that Hanna has seen fit to put on a plate is like bliss passing through your lips. The building, again, has an amazingly impressive past, which is not forgotten in the décor. If dinner wasn’t enough, they also boast a secret basement speakeasy, named Manifesto. But I warn you, the list is long and the space is small, so if you’re feeling slightly 1920’s, make a reservation! Block Party: A stroll down a Parisian sidestreet isn’t really an 8-hour flight away. 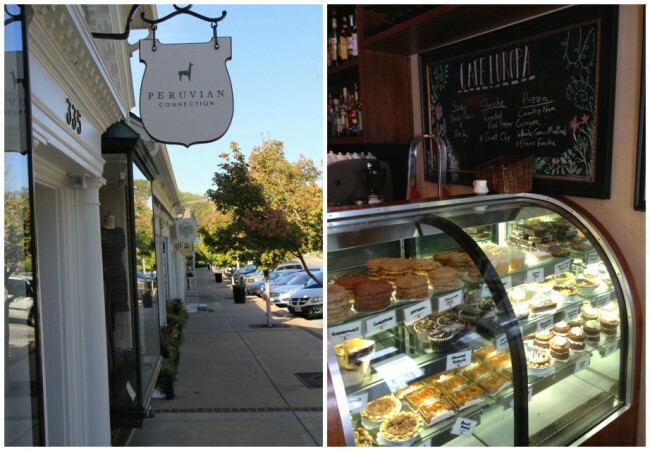 The historic Crestwood Shops is a highly curated line of local merchants and restaurants offering unique clothing, cuisine, wine, antiques, home décor, and even flowers. Posh and artisan, our neighboring merchants at Crestwood offer an experience that is untouched by anything else in Kansas City. From the hard-to-find wines of Underdog Wine Co. to the exquisite fine English antique furniture found at Charlecote, you’ll be shopping like the locals when you meander down 55th street. Of course it goes without saying that one of our favorite places to spend time soaking in some culture is the Nelson-Atkins Museum. Along with our most coveted hidden gems of Kansas City, there are many more amazing events, shops, eats, and experiences that set our city apart. So next time you find yourself deep in the heart of the Midwest, venture out and take it all in, who knows, you might fall in love with us! Each Peruvian Connection sweater is an investment of time, materials and a bit of love. Knowing this, we think that caring for your sweaters is just as important as seeking them out and falling for them in the first place. Once you find the sweater you’ve been seeking, keep these tips in mind to keep your knit in tip-top shape. Sweater pilling is caused by friction, which could mean something as simple as your arm repeatedly brushing against your side. To remove these inevitable pills, use a sweater shaver to safely trim them away without damaging the sweater’s main fibers. Always use cool water whether hand washing or using your machine, since warm or hot water can cause wool fibers to shrink. 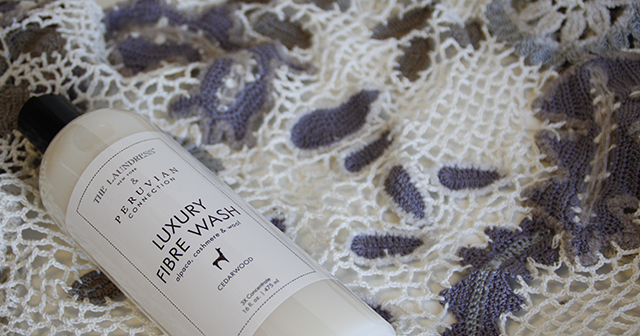 Use a mild soap like our Luxury Fibre Wash, which has a natural, non-toxic formula that maintains the garment’s natural lanolin and oils. Don’t wring or twist your sweater—press gently instead to remove any excess water. Dry flat on a towel after smoothing out any wrinkles and seams. First, forget using hangers: sweaters shouldn’t be hung up, as their weight will tug down on the hanger and leave you with a misshapen knit. Ideally, you would store any hand-knit or hand-loomed sweater flat, but you can fold or roll your knits for nearly crease-free storage that will help retain their shape. If you’ll be storing your alpaca or wool sweaters, be sure to do some mothproofing: most dry cleaners will offer this service, but you can ward off bugs by first cleaning your items and then storing them in clothing storage bags (rather than plastic containers, which can cause mildew) with sachets of lavender or cedar blocks included. Here are our 4 steps to taming the closet chaos, and weeding out your wardrobe. 1. It’s a Head Game: In one of my many lives, I was a professional stylist and helped women get their closets in shape. The biggest roadblock for every woman was being mentally able to detach themselves from their clothes. No matter how unflattering, ill-fitting or out-of-date items were, women would hang onto them with a death grip. A little tough love and a tear or two later, the realization set in that parting doesn’t have to be such sweet sorrow, but more of a liberating and cathartic experience, and ladies were dominating their donation pile! Once you prepare yourself for purging, this process will become easier and even enjoyable. *Expert Tip: if it doesn’t fit today, don’t count on it fitting tomorrow! 2. Be a Giver: Unless something is thread-worn or stained, DONATE IT! Knowing your clothes are going to someone who really needs them not only makes it easier to say goodbye, it gives you the opportunity to give back to your community. Pick an organization you’re passionate about and let ‘em have it! And forget that excuse “I don’t have time to drop my things off” or “My haul is too heavy.” Call the organization and 9 times out of 10, they’ll send someone to pick up your donation. *Expert Tip: get those items out of your house ASAP! The longer they sit in your livingroom, the more you’ll be tempted to rescue items you were unsure about. 3. The Good of the Group: Once your closet is free and clear of what I call white noise, it’s time for the easiest of the entire closet conditioning tasks. We only wear about 30% of what is housed in our closet – to up this percentage and give you a fighting chance at sporting all your items, group them. Not only will grouping your closet by color, sleeve length, and style make it easier to get more pieces back in rotation, putting your clothes away won’t be as daunting! *Expert Tip: organizing your shoes in the same fashion will achieve the same result while upping your outfit ante. 4. Round It Out with a Recap: You’ll notice that while on this journey to Closet Mecca, you’ll rediscover long lost pieces you forgot you had, become inspired by new outfit pairings, and find there may indeed be some key items missing from your repertoire. Put the rediscovered pieces in appropriate places in your closet so you’ll wear them. Take pictures of new outfit inspirations so you don’t forget. Make a list of all the items that you think might be missing. *Expert Tip: stop before you shop! Do this step before you open your coin purse and you’ll be amazed at how much money you’ll save on things you never wear! In closet conclusion, everyone loves something shiny and new, but when you get your head in the game and become a giver for the good of the group, seasonal transitions won’t be so terrifying. Maintaining order will become second nature and your checkbook could become fatter.